I saw PearlJem on googletalk with this status message. I asked her if it's true, totoo daw. Shocking! 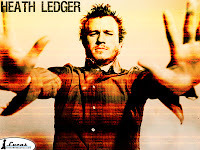 Heath Ledger dead at 28. I felt a bit sad because somehow he reminds me of someome and it's kinda unnerving to imagine that this someone could be him. my own take. belated happy new year nga pala, Ate Fiona! parang di ko pa rin matanggap...hehe! fave namen magkakapatid ung a knight's tale e. amp!